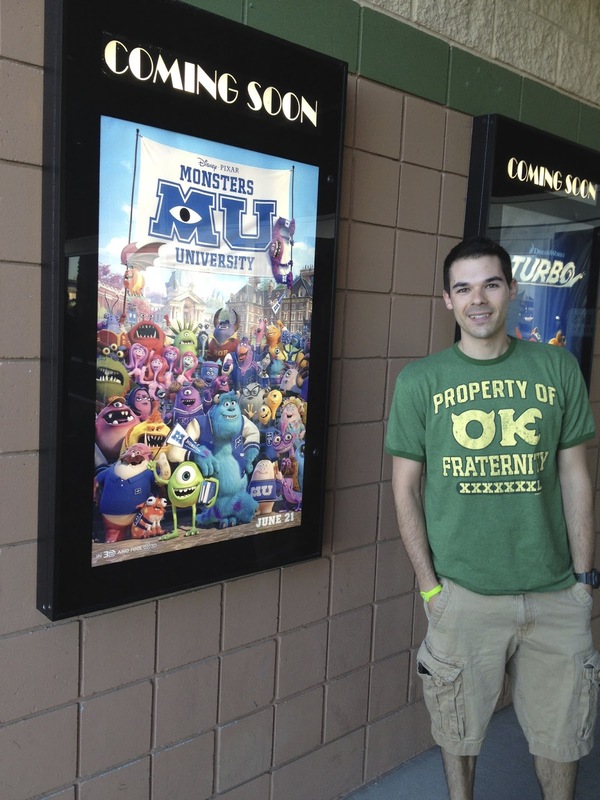 With all the excitement surrounding Pixar's next two brilliant films being released later this year, Inside Out and The Good Dinosaur, I've been reminiscing on when their last movie, Monsters University, arrived in theaters. 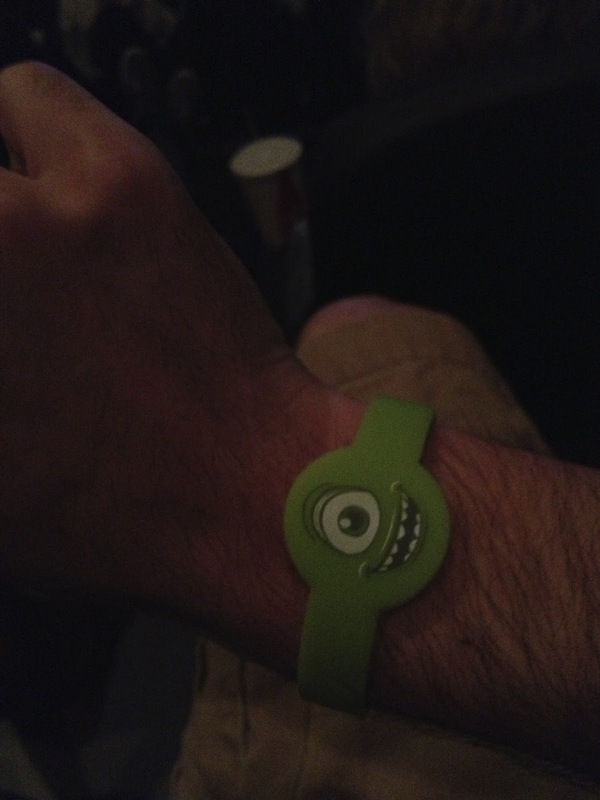 The first time we saw Monsters University in theaters was actually at an advanced screening (roughly two months before the June 21st US release)! 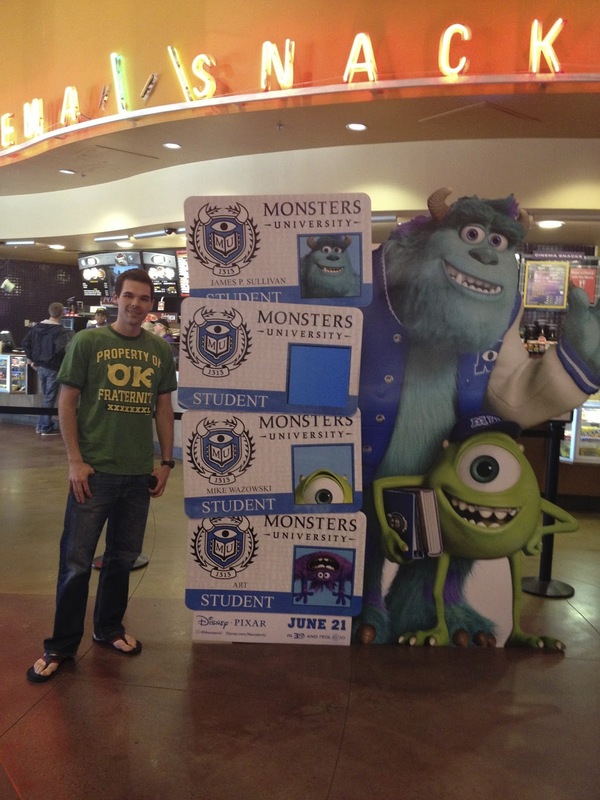 When we found out that there were select theaters around the country that were going to be pre-screening MU for college students, we had to find the closest participating theater immediately. We found out the closest would be on April 24th in Salt Lake City, Utah (about four hours away). Needless to say, we marked the calendar without any hesitation and with no questions asked. It was a done deal! 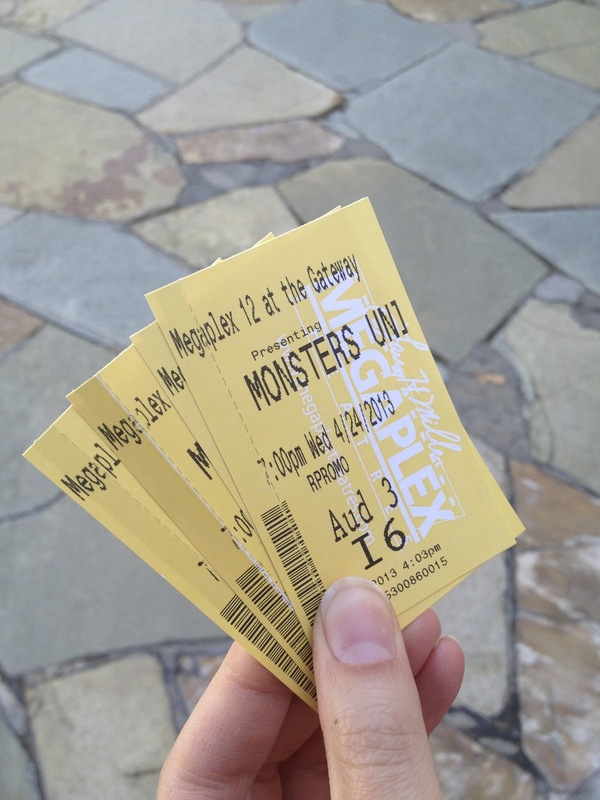 When the day came, we anxiously (and with much excitement) made the long trip down to the Salt Lake Megaplex 12 at the Gateway Mall. We got our tickets early - and without a hitch - and waited the few more hours until the premiere. While we waited, we headed over to the Disney Store which was just down the street. 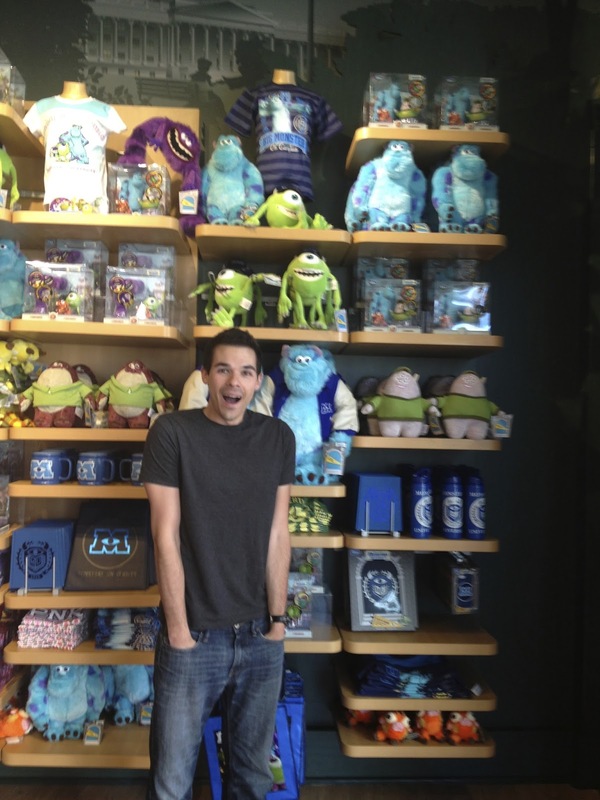 It just so happened that the first batch of MU merch was just released there that day! Perfect timing right? I had no idea. 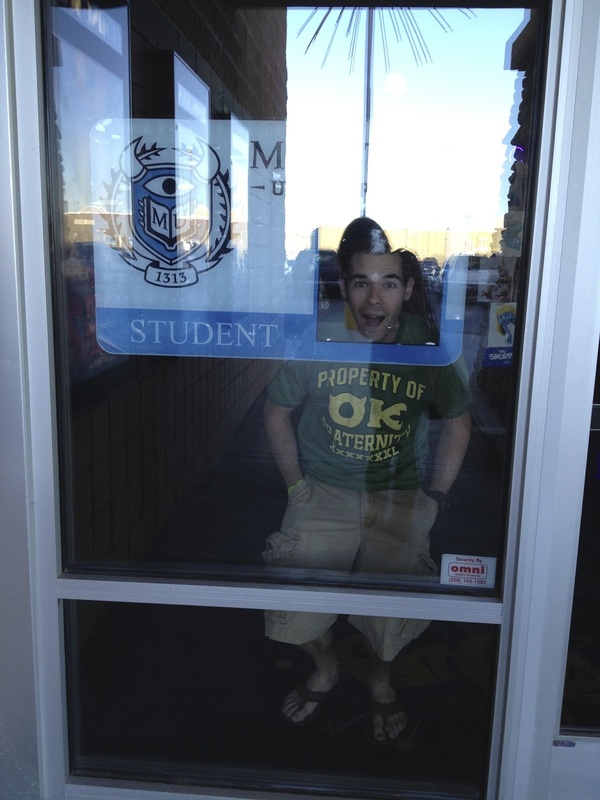 The coolest part was that I was able to pick up an "OK" Fraternity T-shirt to wear over to the screening. I was so pumped! 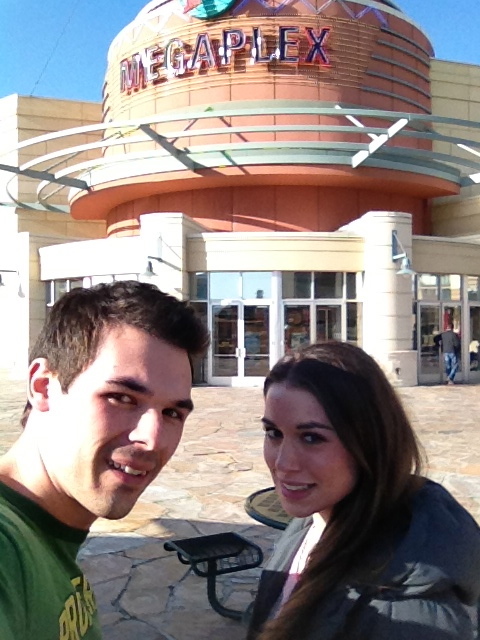 About 45 minutes before the movie started, we went back over to the theater to secure us a good spot in line. We of course needed fantastic seats - that was a must! 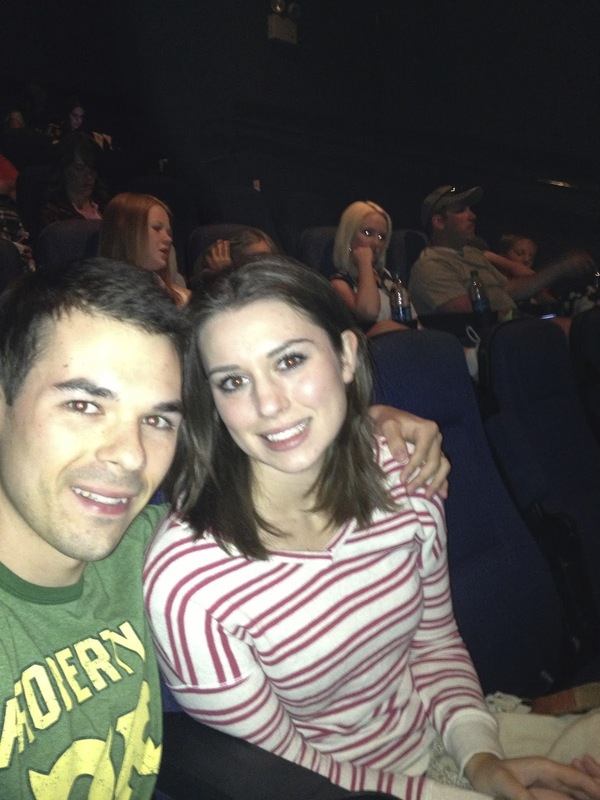 My cousin Jake and his wife Jordan met Brita and I there as well. They were super excited too! Below is a pic of us right as we were about to go in (right before we were required to leave all phones, cameras, etc. outside of the screening room)...and yes we did end up getting really great seats! We all LOVED the film and couldn't wait to see it again when it arrived in theaters officially. I also vividly remember a few people coming up to me after and saying "cool shirt!!" or "No way! Where'd you get that shirt??" They were impressed I had a tee from the film already. About two months later, we were thrilled to finally have the opportunity to catch the film for the second time (and it wouldn't be the last - I probably ended up seeing it about five times in theaters total). Our theater in town was having a screening at 8:00 the night before release on June 20th! Another "early" screening? Oh yah, count us in. 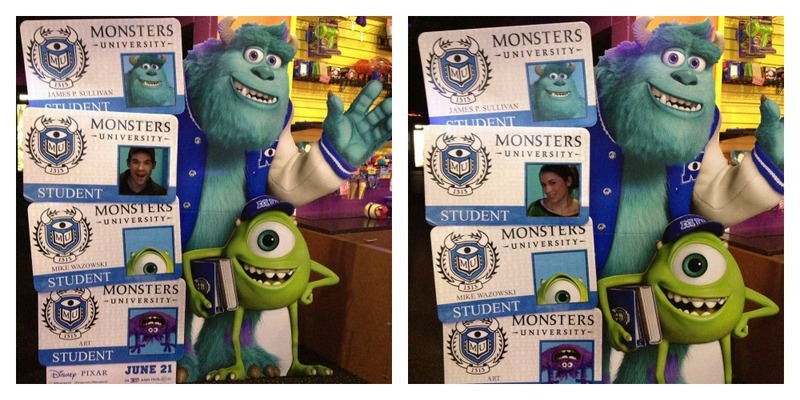 There we have it- our fun adventures with Monsters University in theaters! 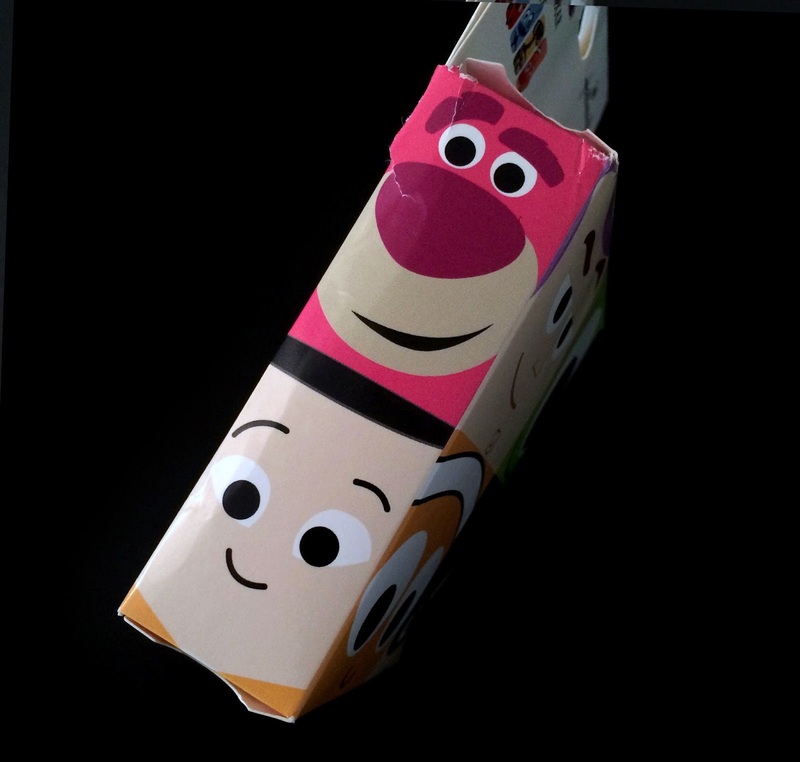 I cannot WAIT for Pixar's 2015 offerings, but like my Grandad always said "well, you're gonna have to." When the time finally comes, I'll be posting a similar documentation here. 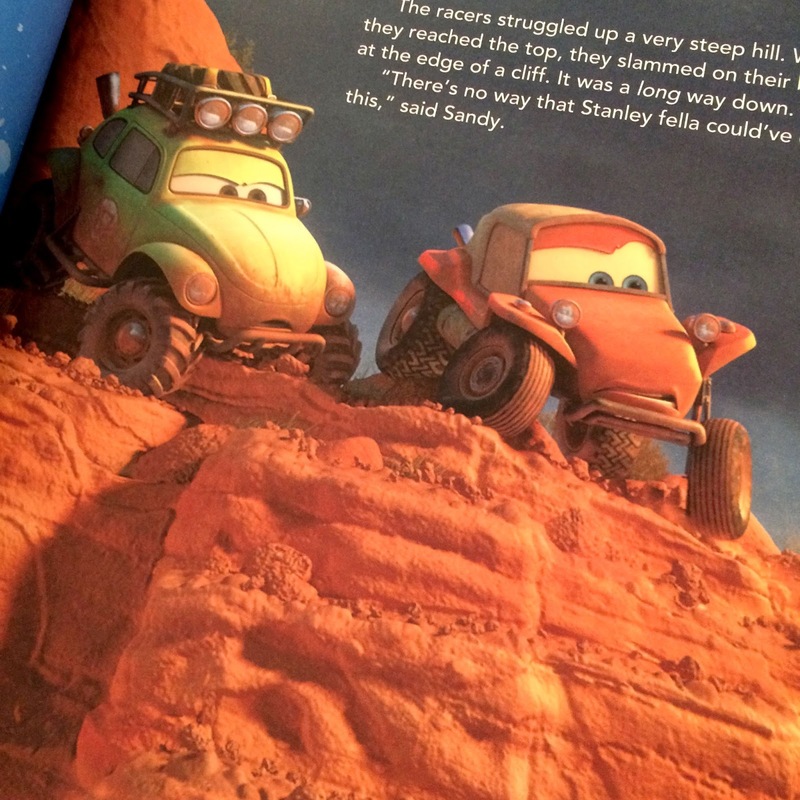 Look for that in June (Inside Out) and then again in November (The Good Dinosaur)! 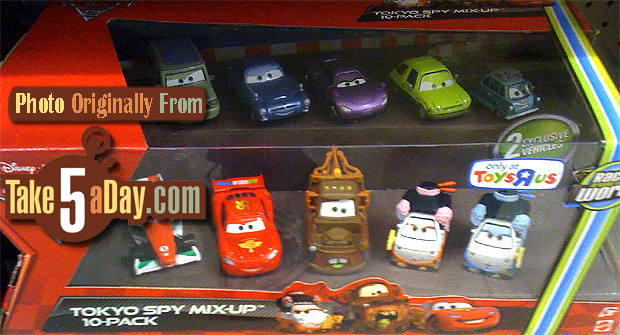 If you're an avid reader of my blog, then you know how impressed I've been with the current Hallmark exclusive line of Disney·Pixar collectibles. If you haven't seen some of what they have to offer there these days, check out the Hallmark website HERE or visit one of their stores. 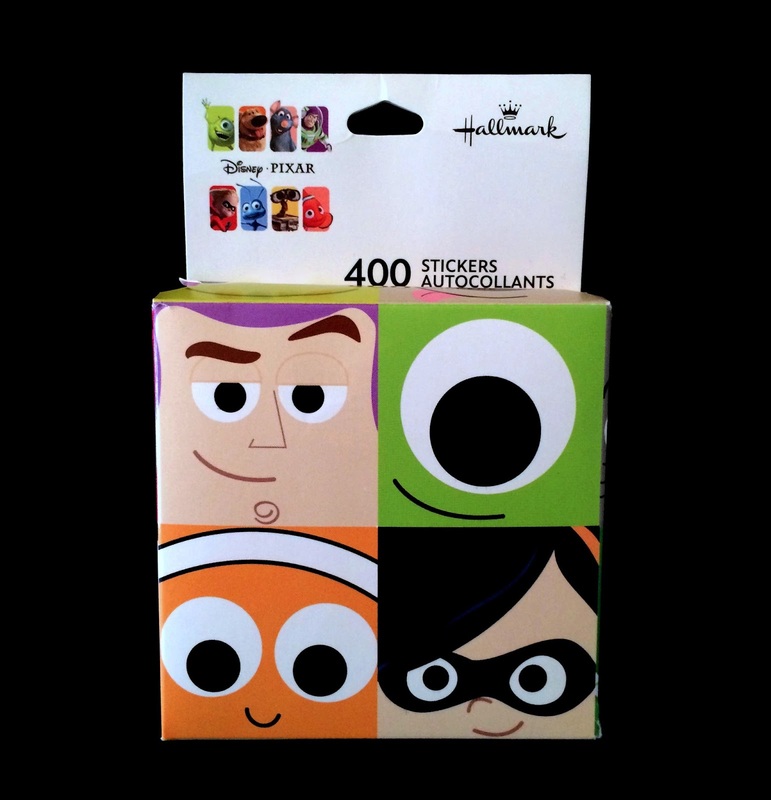 One of the products I was instantly drawn to when I saw it was this boxed set of 400 stylized Pixar stickers! 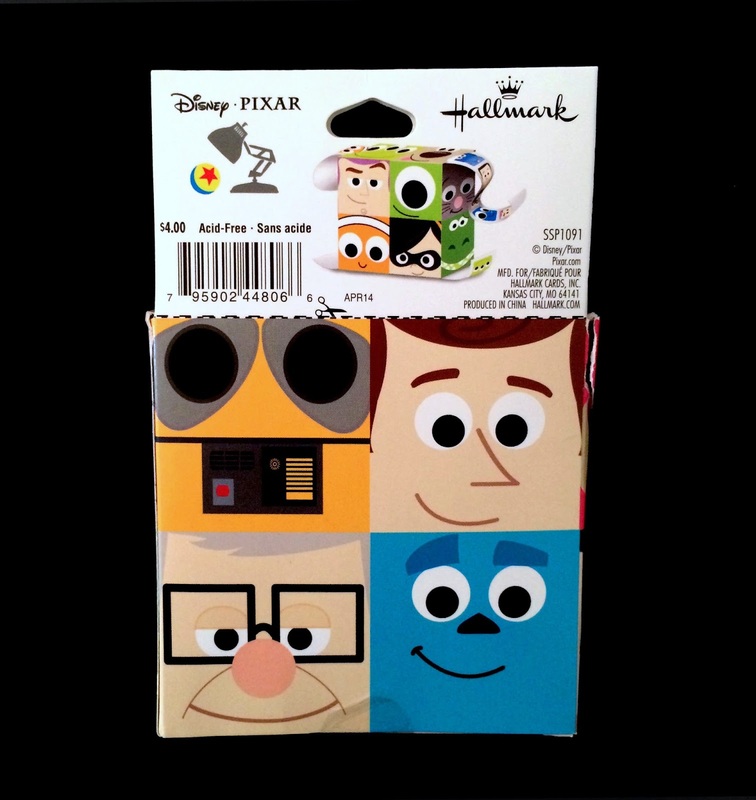 The characters featured here are the same fantastic, unique square designs that were revealed on certain products back during the 2013 Disney Expo. I've always loved these designs, so I was thrilled to have an additional product released with them (see other collectibles released in this style such as a mug set, a second mug set, a note card set, a notebook, an iPhone case, a Sticky Note Set and a pencil/eraser set). 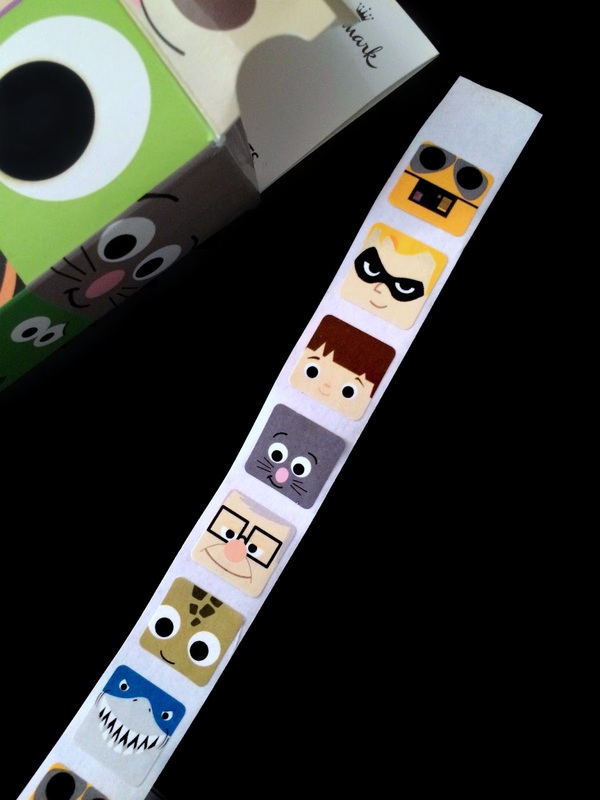 As seen on the back of the package, this sticker box doubles as a sticker dispenser! Just cut off the top portion of the pox and hang a small section of the stickers out of the top side. There are two rolls of stickers inside. 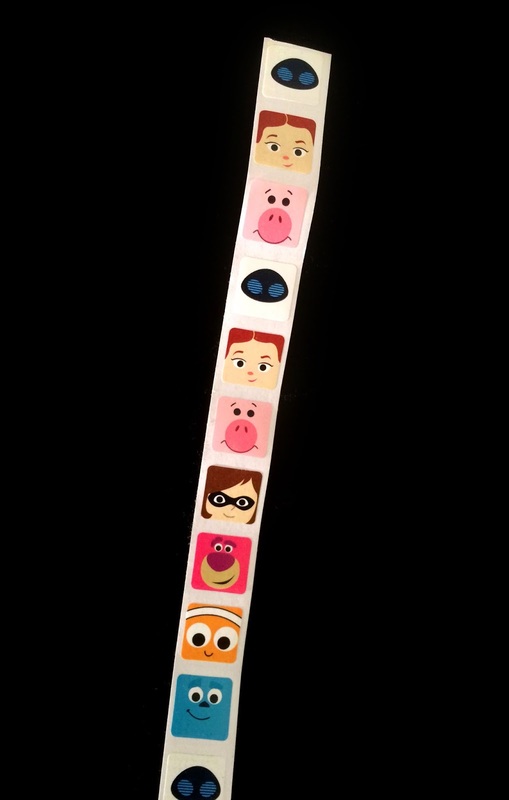 The first roll features stickers of Dory, Russel, Violet, Flik, Pizza Planet Alien, Jack-Jack and Buzz Lightyear. 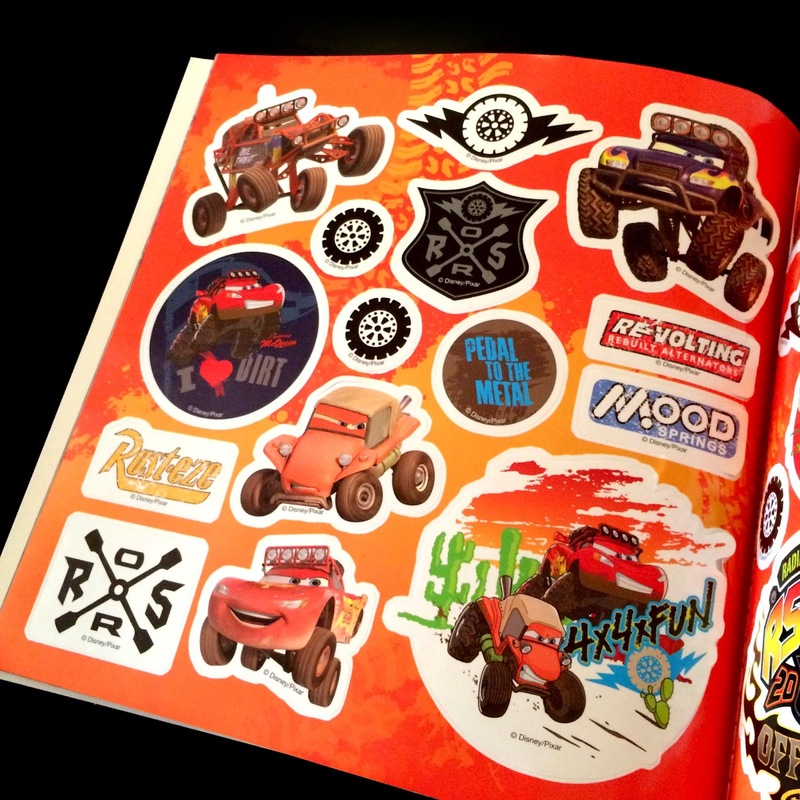 The second roll features stickers of Wall·E, Mr. Incredible, Boo, Remy, Carl, Squirt and Bruce. 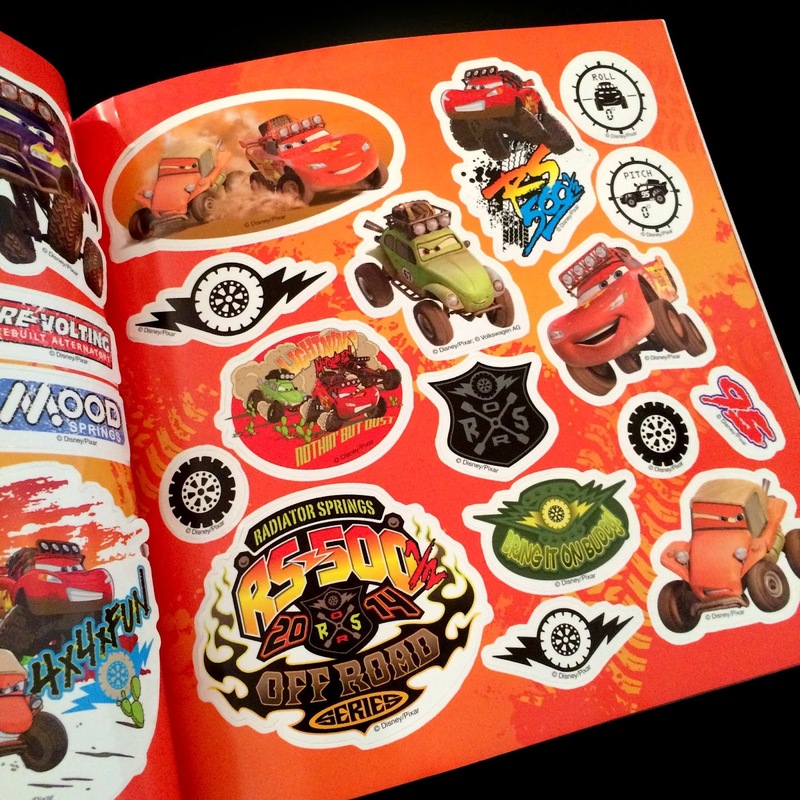 Unfortunately, most of the designs featured on the outside of the box (such as Lotso, Rex, Dug, Woody, Sulley, Mike and Nemo) are not included as stickers with this set. 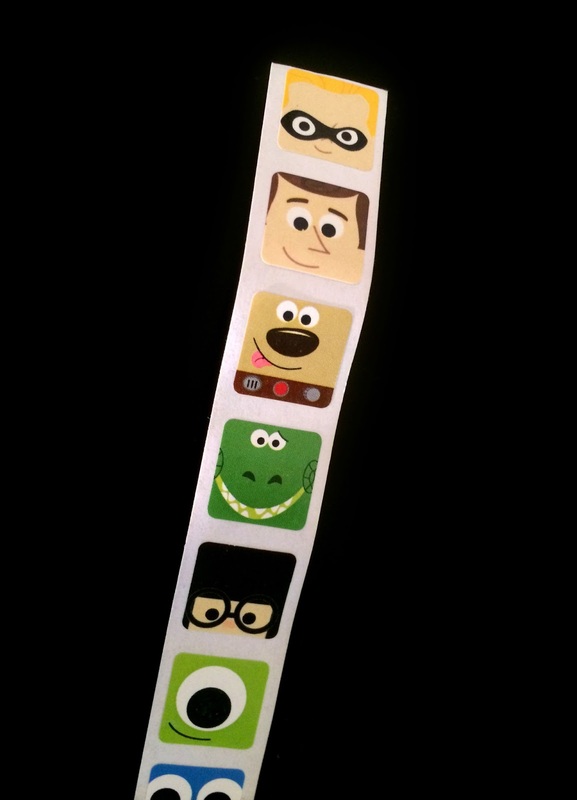 Despite the smaller selection of characters than I anticipated, this is a fantastic set of stickers. It's well worth the $4.00 price tag. These are not available anywhere online, so if you're interested in getting these for your collection, head to local Hallmark store ASAP! These won't last there long and will most definitely become hard to find. A big thanks to my parents who surprised me with this in the mail yesterday! I had no idea it was coming. Since I'm not currently living near a Hallmark store, I had described this to my mom for her to track down. She had looked for weeks at multiple stores and finally found this one set, but I never even knew she was actively on the hunt until yesterday. So awesome! So, something pretty funny and remarkable happened today. 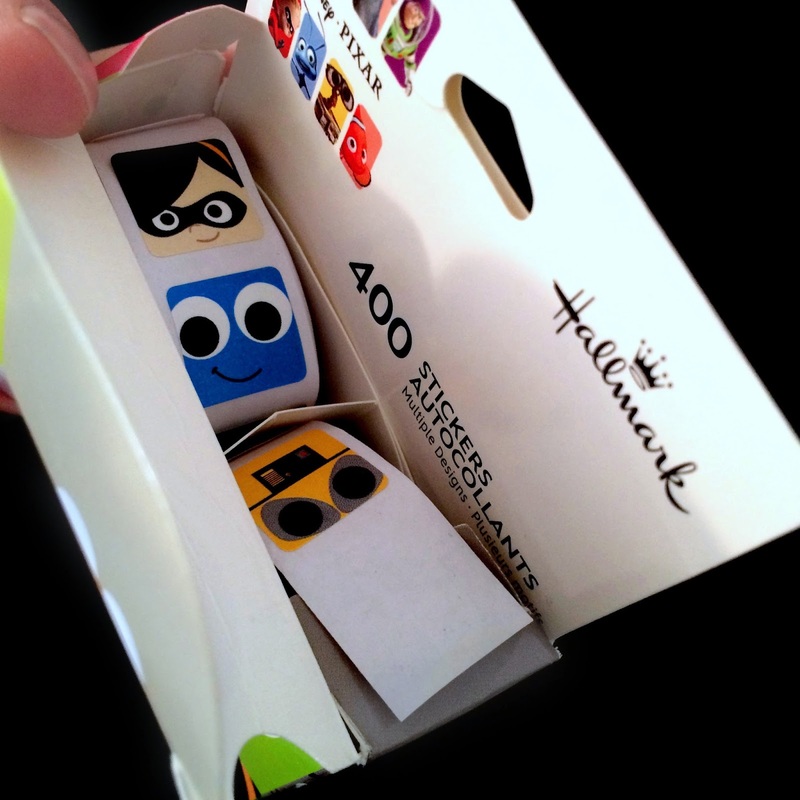 I got a comment from blog reader Kristie earlier this afternoon, informing me that this box of stickers does in fact include two additional rolls of stickers (featuring the additional characters seen on the outside of the box that I had mentioned were missing) that are found by opening the bottom portion of the box. I thought, "how could I have missed that? I know I checked the bottom!" But, alas, I checked again and there were no such stickers. At this point I figured that my box had some kind of factory error where they only included two rolls of stickers instead of four. I knew it was weird that there was such a slim selection in my box! My plan was to now track down a new set, but how? I don't have a Hallmark near me, so that would pose a problem. Luckily, Kristie also informed me that these were now starting to show up at Walmart (which gave me hope in finding them). Meanwhile, little did I know that (at almost the exact same time) my wife Brita was at Walmart where she just happened to stumble upon the stickers! She had no idea that I now knew that they sold at Walmart or that I was now trying to find a new set to get my rightful missing stickers. However, she did know, in general, that I had talked about how I wish I had an additional set to actually use...so she bought me three boxes! When she walked in the door, she completely took me by surprise with them. I told her about the crazy coincidence/timing she had since I had just found out that new information about them earlier today. I told her about how I found out that stickers were actually missing from my original box, so we immediately opened the bottom of one of these new ones to see what we could find. The third roll features stickers of Eve, Jessie, Hamm, Mrs. Incredible, Lotso, Nemo and Sulley. The fourth and final roll includes Dash, Woody, Dug, Rex, Edna and Mike. There we have it. The mystery of the missing stickers solved. My sticker set is now complete (the final count per box is 400 stickers total, 100 stickers per roll and 27 characters). A big thanks to Brita for coming home with such a fantastic surprise! Also I'm happy that I now have four boxes of these things- they're gonna last a long time! 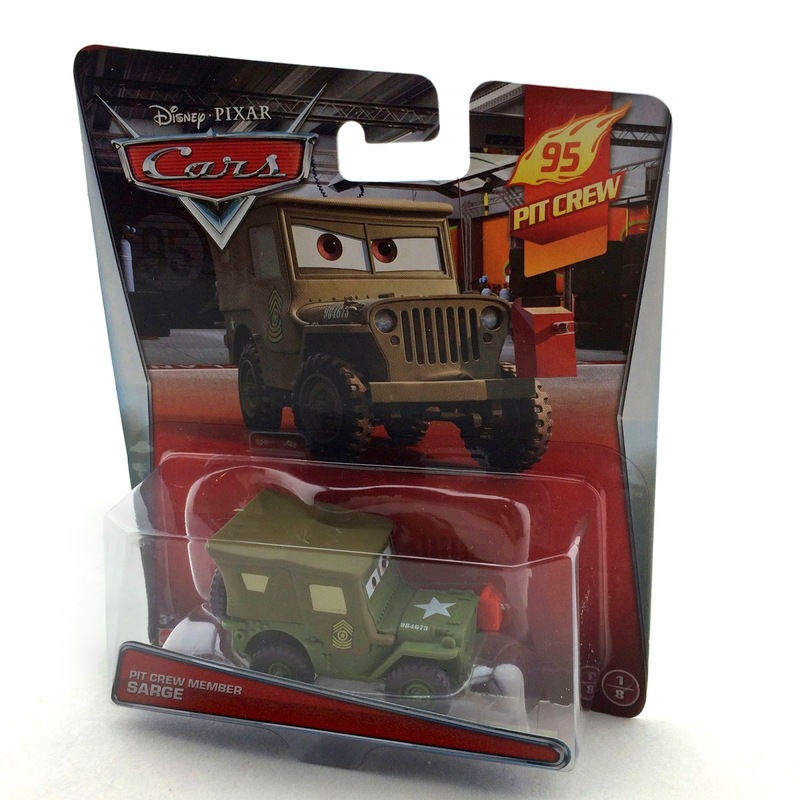 From the brand new 2015 Mattel Disney·Pixar Cars collection, here we Pit Crew Member Sarge! This version of Sarge was originally available in the "Final Lap" and "Lenticular Eyes" series a few years back, but since I missed him then, I'm really happy for this re-release. This 1:55 scale diecast includes a plastic gas can accessory (non-removable) and is #1/8 of this year's "95 Pit Crew" sub-series. 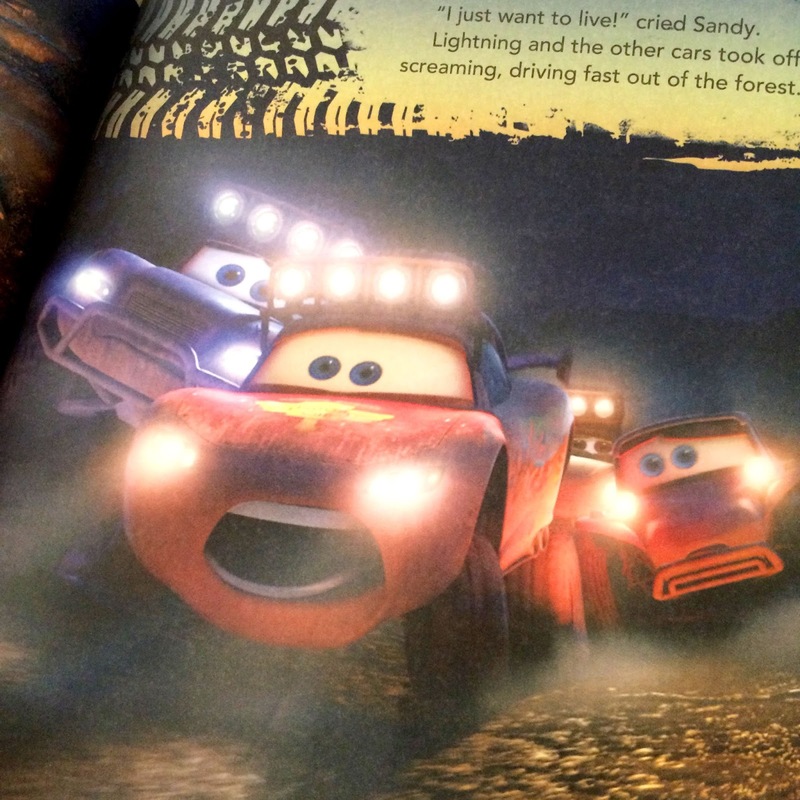 As shown in the screen shot above, Sarge is seen this way near the end of the original Cars (during the big Piston Cup race) when he becomes a part of Mcqueen's official pit crew. 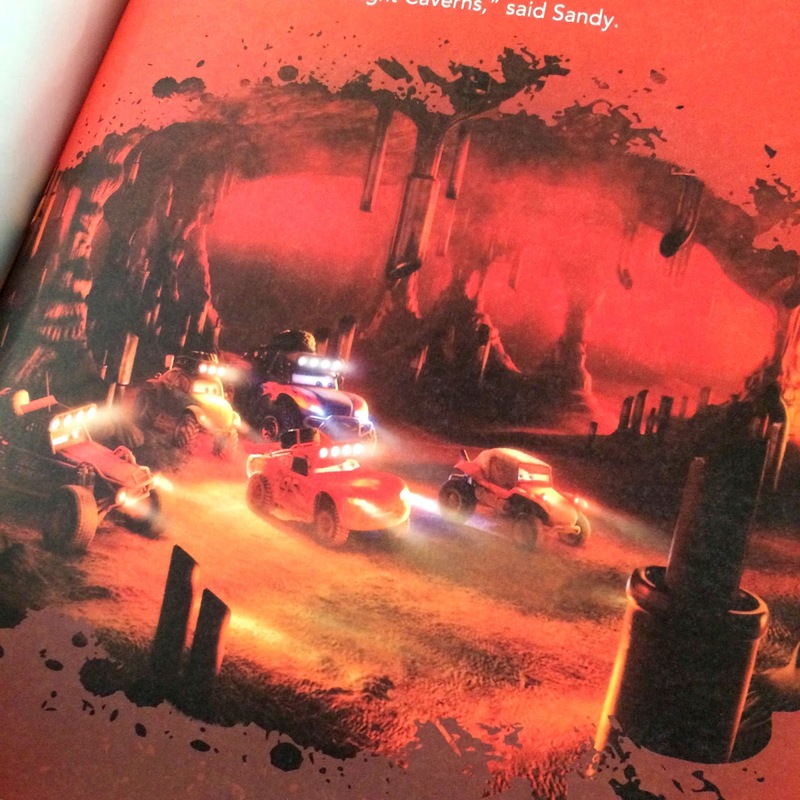 Look for Pit Crew Member Sarge in stores now! 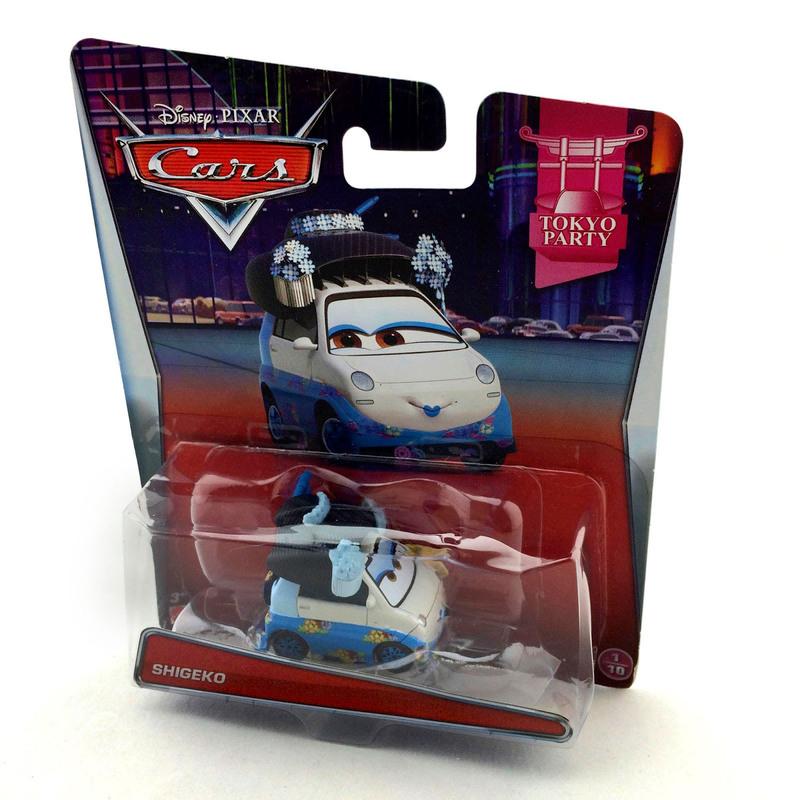 From Mattel, here is the brand new 2015 Shigeko from Cars 2! This character was originally only available in a Target exclusive 10-pack (called Tokyo Spy Mix-Up, seen HERE) a few years back, but has just been recently released as a single for the first time. She is #1/10 of the new "Tokyo Party" sub-series and is a 1:55 scale diescast. As shown in the screen shot above, Shigeko was seen in the film only for only a brief moment. She is one of the Japanese fan dancers near the entrance of the Tokyo WGP welcome party. 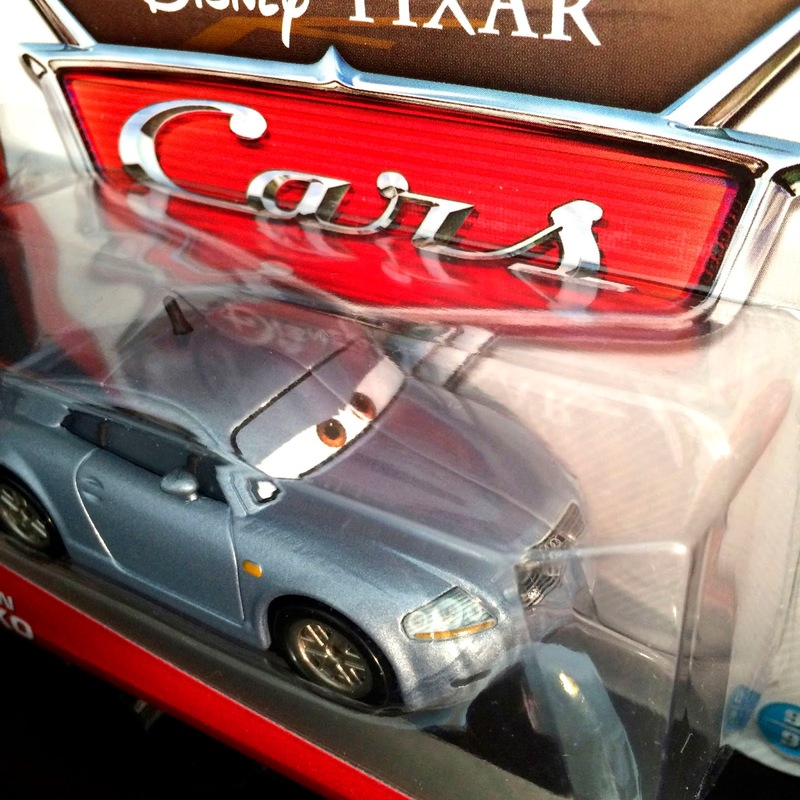 Since this car was only ever available in that 10-pack, I was never able to get my hands on it until now. This is a most welcome (and anticipated by me) addition to my Cars collection! What's also exciting is that her other two friends (seen beside her in the film) will also get releases this year; so look for those updates here in the near future. Look for Shigeko in stores now. 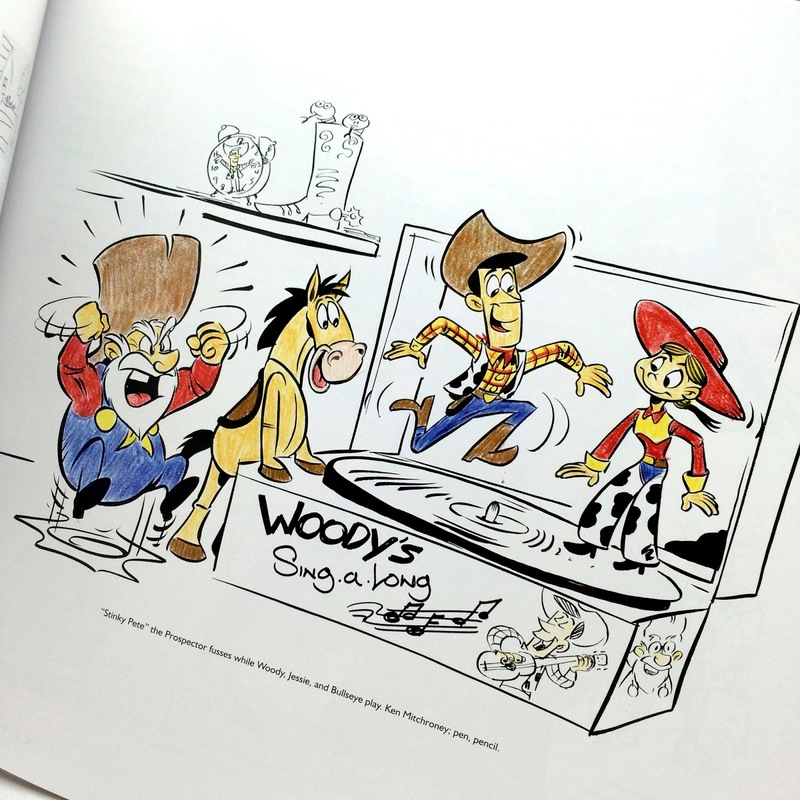 The Toy Story Films: An Animated Journey is the definitive "making of book" in regards to Disney·Pixar's incredible Toy Story trilogy. 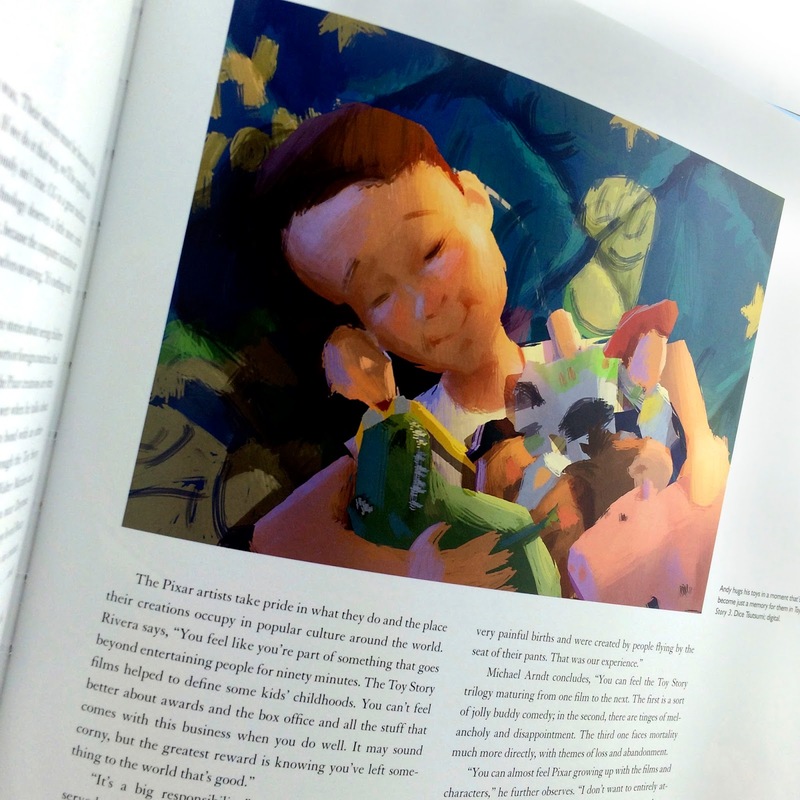 This massive book chronicles Pixar's earliest beginnings (the formation of the early Pixar team, their first short films, their television commercials, etc. 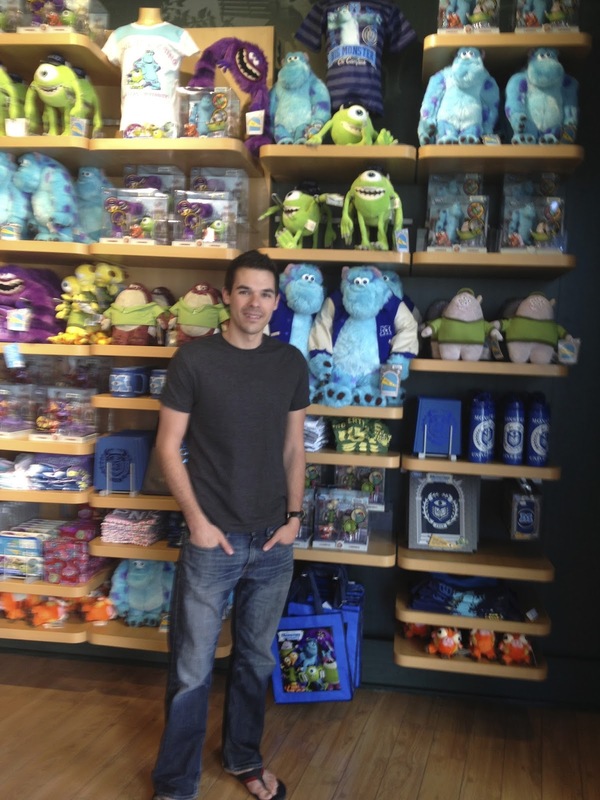 and how all those were impactful on making Toy Story possible) through the making of all three films in the franchise. 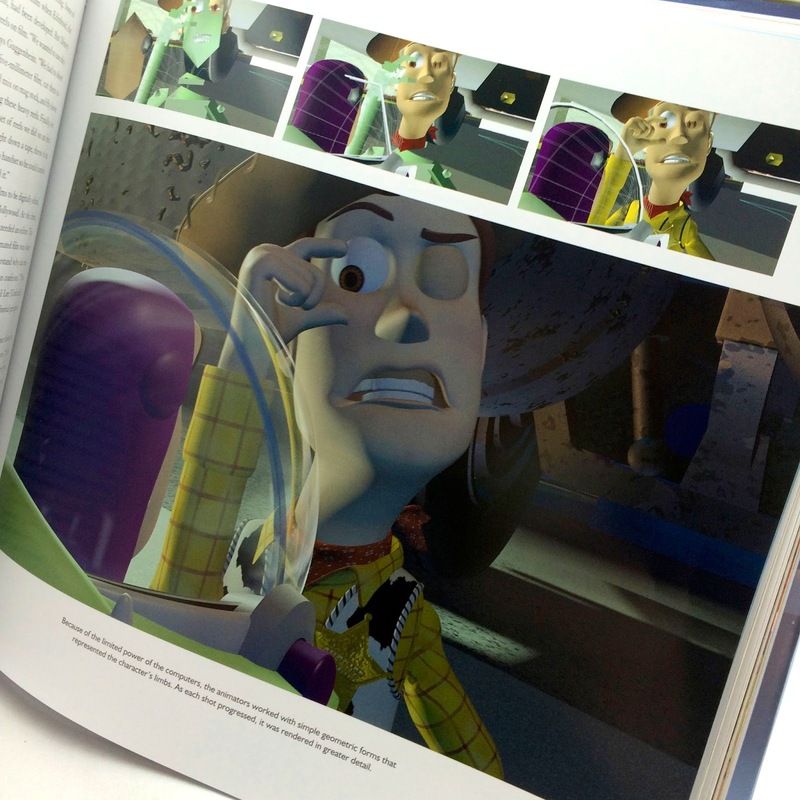 Even if you're familiar with the history of Pixar and Toy Story films (as this book as similar information found in other Pixar books and documentary films), this book presents it in a fresh, simplistic, well written way with loads of great quotes, concept art, historical photos and final rendered screen shots. 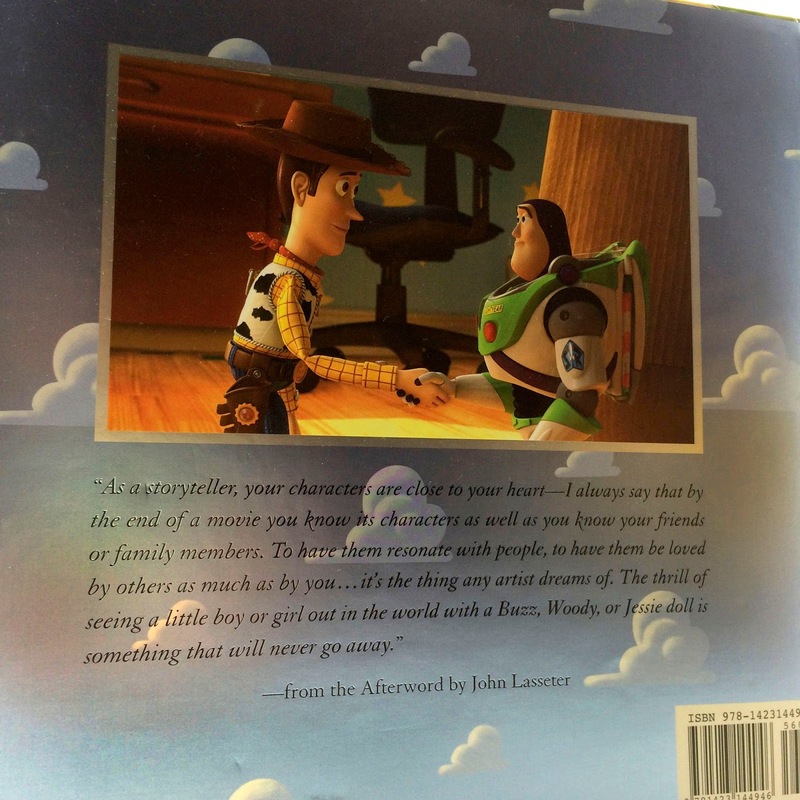 This hardcover book was released in August 2012, is written by Charles Solomon (with Foreword by Hayao Miyazaki and Afterword by John Lasseter) and is 192 pages. It measures 11.8 x 11 inches. Imagination. It’s an innate quality that every child seems to possess in immeasurable quantities. Imagination allows children to create wonderful worlds in which to relate to their friends, envision their futures, and, of course, play with their toys. More often than not, imagination is a quality that diminishes with age, as fantasy worlds are replaced by “the real world” and inquiring young minds are forced to grow up. But there are those among us, who, like Peter Pan and the Lost Boys, never stop using their imaginations, envisioning their futures, and, most importantly in this context, playing with their toys. A select group of these individuals—and their unfettered imaginations—are the reason that the Toy Story films came to be. The Toy Story Films: An Animated Journey tells the tale of the incredibly talented visionaries who conceived, developed, and ultimately shared Woody, Buzz, and the rest of Andy’s toys with the entire world. 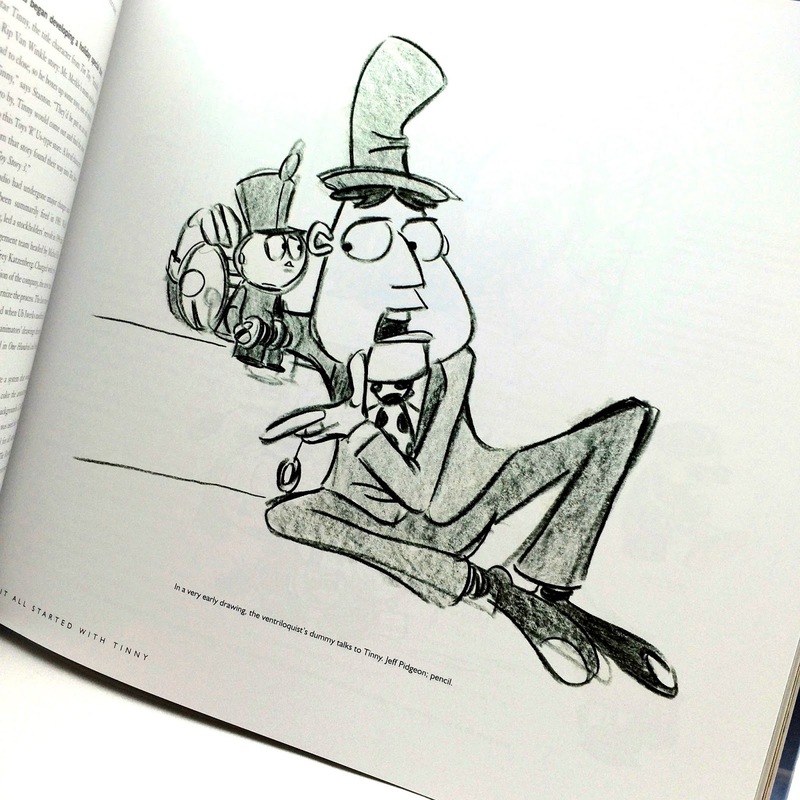 Their story is recounted within these pages through candid interviews with the animators, directors, and voice actors who brought the films to life; artwork that inspired, grew into, or became a part of the iconic movies; and untold details of the growth and development of one of the most lucrative and artistically significant film series ever. It serves as a lesson to us all that we are never too old to use our imagination—and play with our toys. 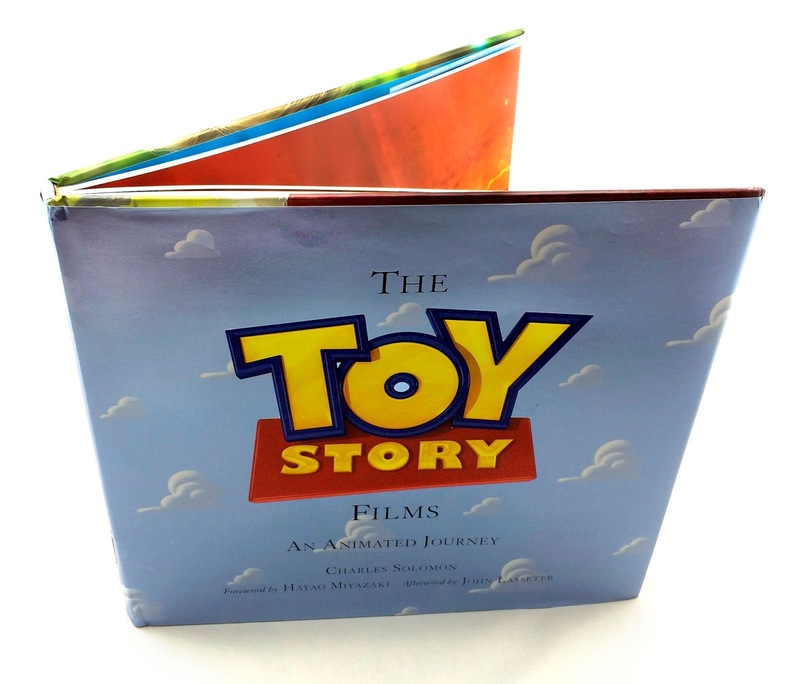 Since there have been no "Art of" books (by Chronicle Books Publishing) for the first or second Toy Story films, this, as well as the 1995 Toy Story: The Art and Making of an Animated Film, are the the closest to those that you'll find. There we have it! 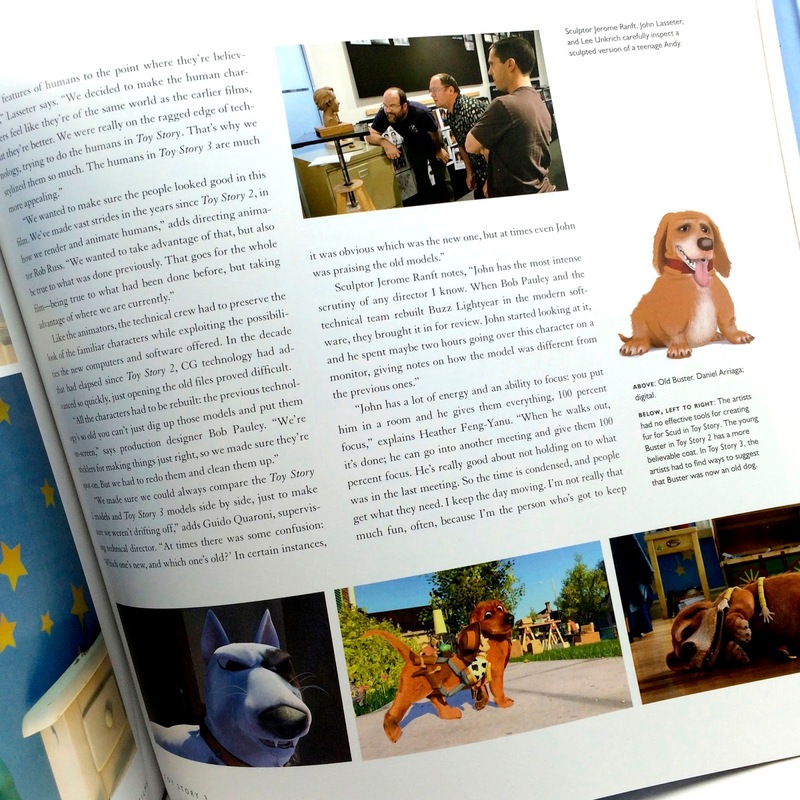 A fantastic, must have book for Pixar fans who adore the Toy Story films and the history of the animation studio. There is so much great new and old information here, that I can't recommend this enough. If you'd like to pick this up for your collection, your best best is to grab it on Amazon. A big thanks to my aunt to got me this for this past Christmas! I've wanted this for quite some time and I'm happy it's finally part of my collection. 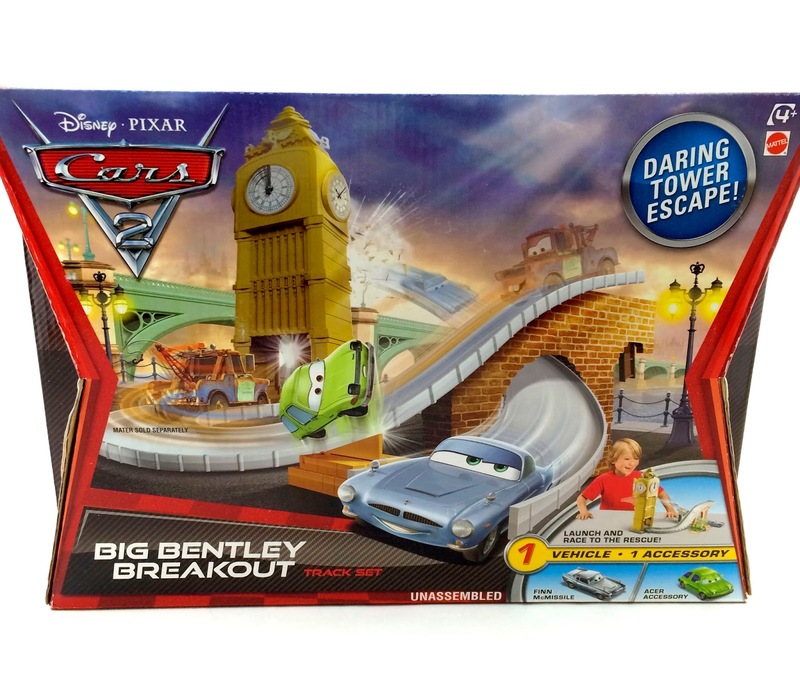 From Mattel, he we have the 2012 Disney·Pixar Cars 2 1:55 scale "Big Bentley Breakout" track set! 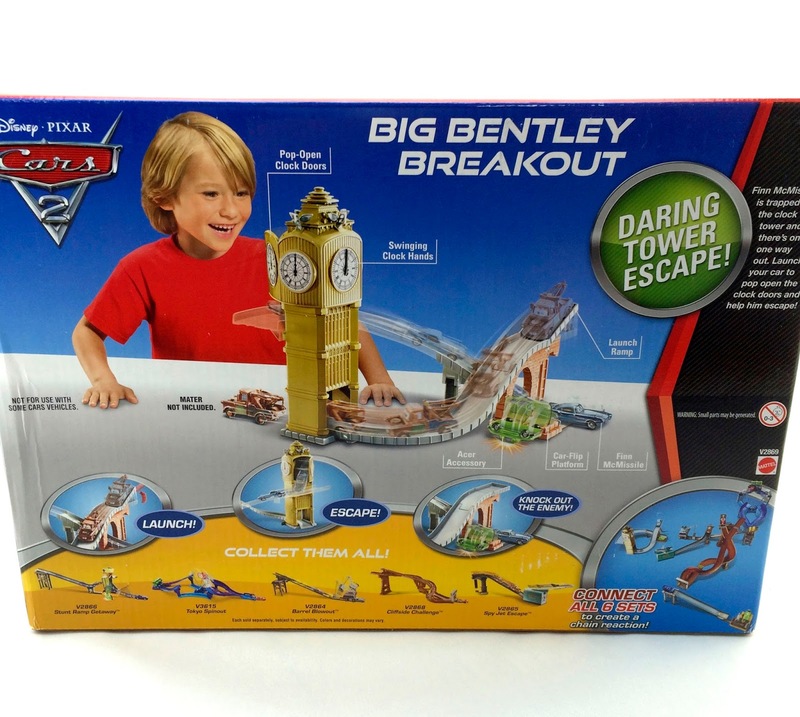 With this, you can recreate the fun and exciting Big Bentley escape sequence seen in the film. What makes this set fun (it's less thrilling just on its own) is that it's one of six other scene specific Cars 2 track sets that connect to make one awesome chain reaction. The others include Stunt Ramp Getaway, Barrel Blowout, Spy Jet Escape, Tokyo Spinout, and the Cliffside Challenge. This set comes with a plastic 1:55 scale Fin McMissile and a hollow plastic Acer accessory. It's also meant to be used with Mattel's diecast line as well. Since I didn't have time to assemble it and take a video of it in action while I was home last month, check out this review by YouTuber BluCollection who goes through all the details. A big thanks to my wife Brita who got me this for this past Christmas as well as the last one I needed for my collection - more on that soon! 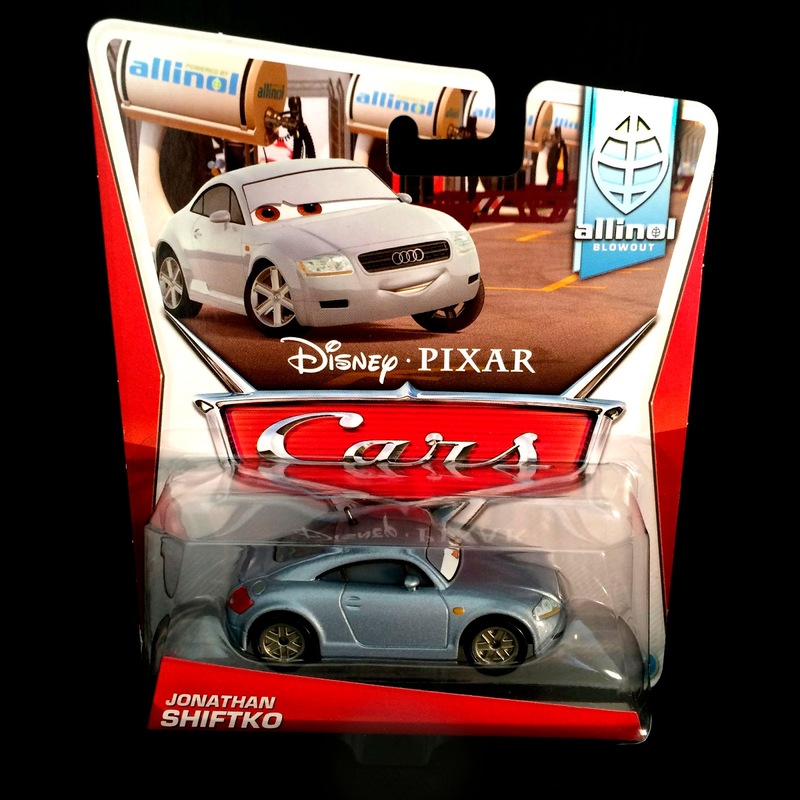 One of the last Mattel Disney·Pixar Cars 2 releases from last year, here we have the brand new Jonathan Shifko! He is a 1:55 scale diecast and is #9/9 of the 2014 "Allinol Bowlout" sub-series. This is his very first release. As shown in the screenshot above, Jonathan can be seen getting angry at Allinol after the "blowouts" begin to happen during the Porto Corso, Italy WGP race. He's on screen for no more than three seconds, so you gotta pay close attention! 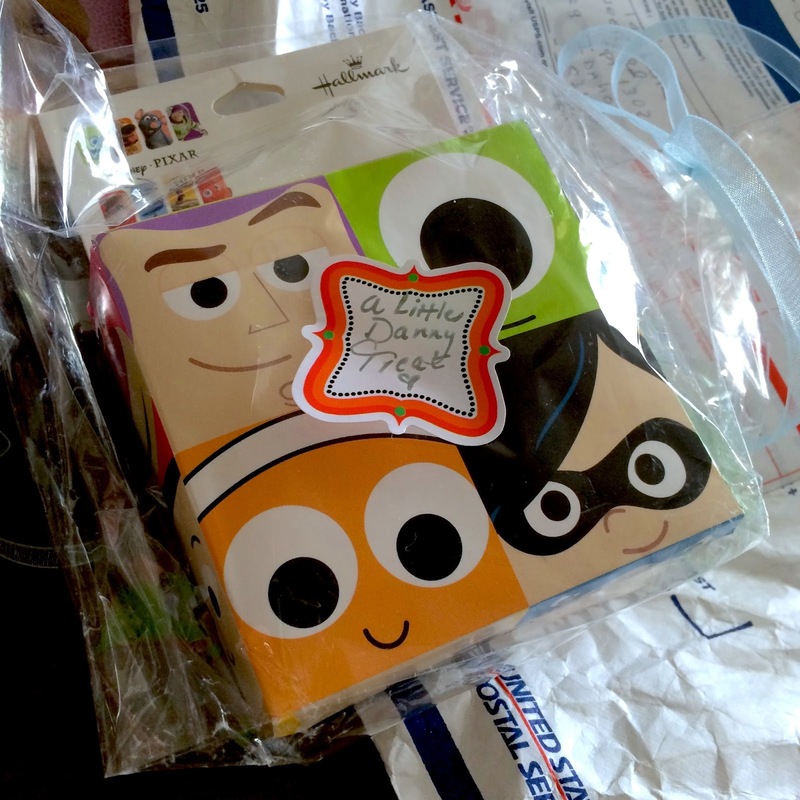 Today's post is a fun update to my Toy Story Mania "Crayon Drawings" Vinylmations collection - which is now complete! Visit the original post HERE to view the full update. 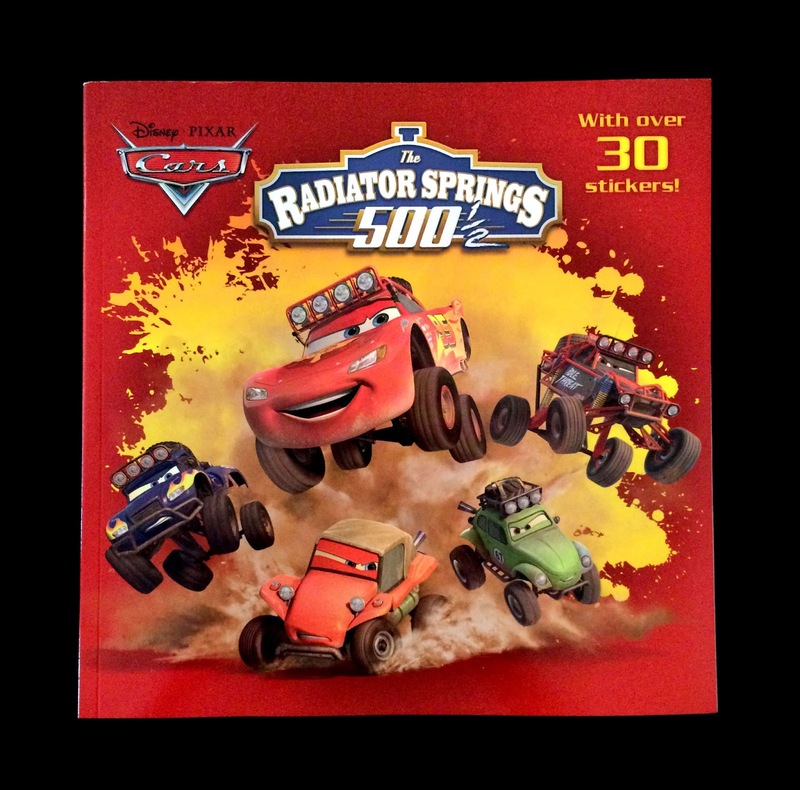 Here we have the recently released "Deluxe Pictureback" storybook based on the latest Disney·Pixar Cars Toon: The Radiator Springs 500 1/2 (which debuted last May on the Disney Movies Anywhere app). 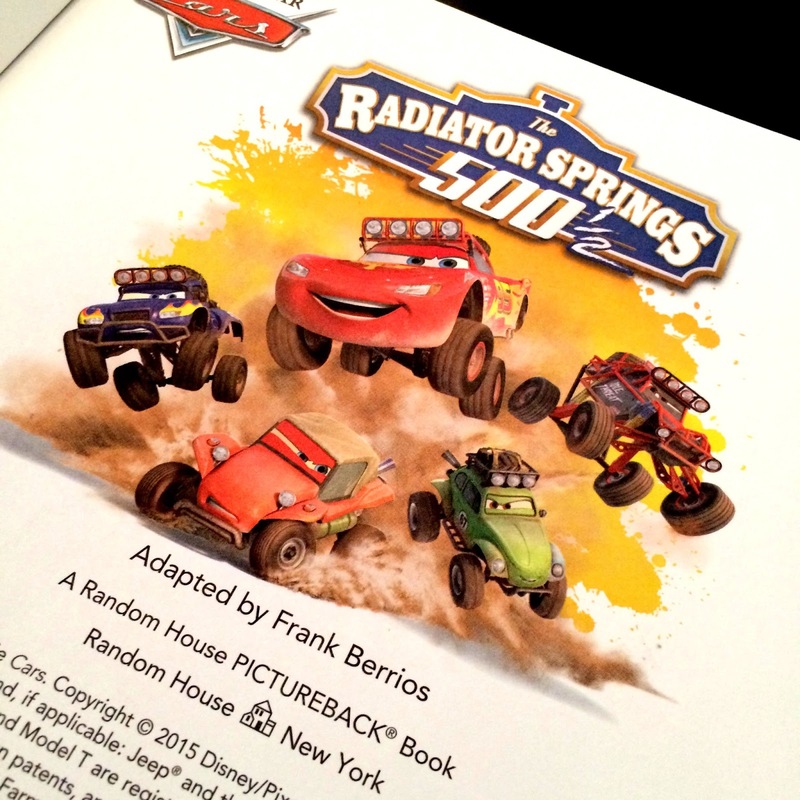 This full-color 24 page book was adapted by author Frank Berrios and illustrator RH Disney and was released on January 6th of this year. 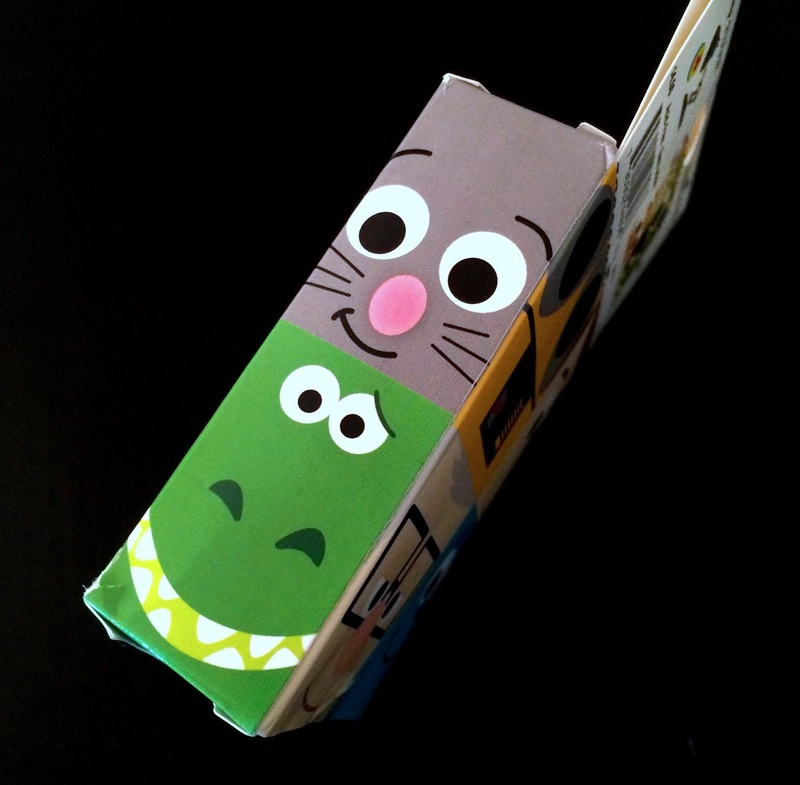 This is a simple, yet fun retelling of the short film is meant for young kids in the 3-7 age range. 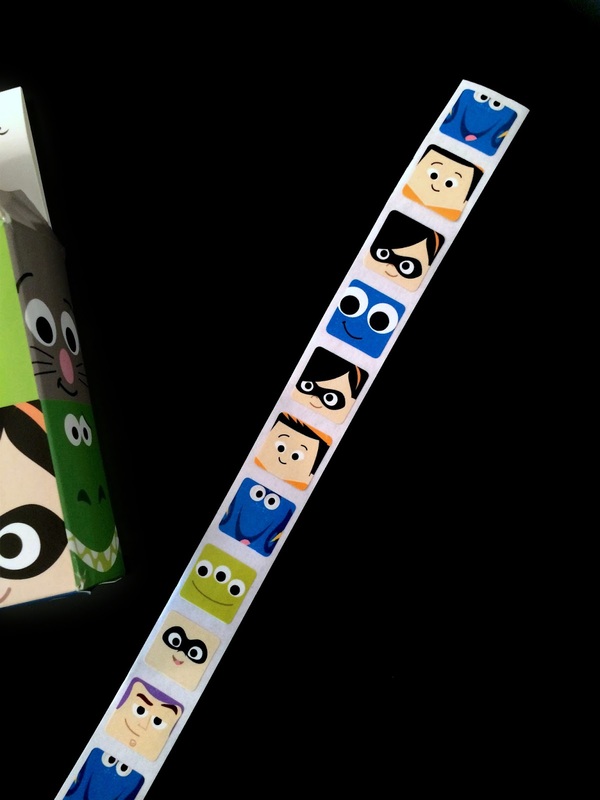 Kids (and the kids at heart) will also love the 32 (very awesome, I might add) included stickers as well! 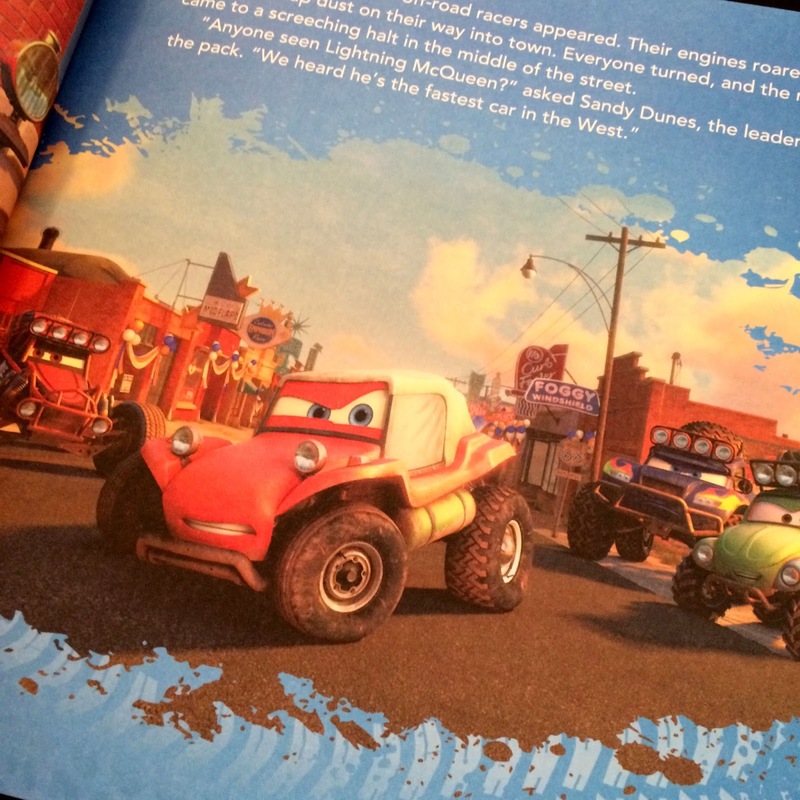 If you and/or your kids are fans of Pixar's Cars films and toons, then this is the book for you! You can snag it right on Amazon for only $4.99.